This has been quite a week for weird Russian space news. The highlights of three stories are below. Although I doubt these proposals will be realized, it's interesting to consider what would happen if they did. 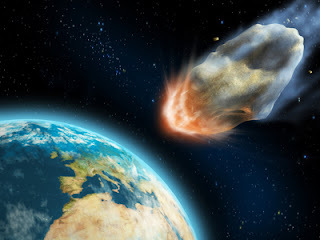 Apophis is a near Earth asteroid that caused a stir a few years ago as initial predictions indicated small but difficult-to-ignore probabilities that it would strike the Earth or Moon on April 13, 2029 or April 13, 2036. Continued studies by NASA's Near Earth Object Program have ruled out any significant chance of an impact. Thus, today's announcement by Anatoly Permino, the head of the Russian Federal Space Agency (ROSCOSMOS), came as a surprise. In an interview today on the Voice of Russia radio, he said the agency is considering sending a spacecraft to Apophis to move it in order to save the world. He didn't give many details on the plan other than there would be “no nuclear explosions” and that everything would be done “on the basis of the laws of physics.” This may imply it'll use the gravity tractor approach. While altering the path of an asteroid is vitally important to the long term survival of the human race on Earth, I don't think experimenting with an asteroid so close to home makes sense. If something goes wrong, the asteroid could end up hitting the Earth where it otherwise would have missed it. I think we should follow the lead of respected groups like the B612 Foundation and study moving asteroids in more benign orbits first. However, I am glad ROSCOSMOS is taking the threat of asteroid impacts seriously and helping raise awareness of the hazard. Pillow Astronaut shared a really interesting story about monkeys on Mars. Apparently, the Institute of Experimental Pathology and Therapy in Georgia has started preliminary talks with the Russia Academy of Cosmonautics about preparing primates for a simulated Mars mission that could lay the groundwork for sending an ape to the Red Planet. They plan a Mars-500 style project to simulate the whole journey to Mars with helper robots to tend to the apes. 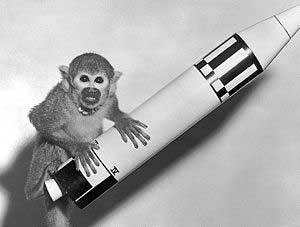 Founded in 1927, The institute has a long history of research with space monkeys. According to the institute's director Zurab Mikvabia, "Earlier this programme was aimed at sending cosomonauts, people, but given the length of the flight to Mars, and given the cosmic rays for which we don't have adequate protection over such a long trip, discussions have focused recently on sending an ape instead of a person." You can read more about this story at physorg/Mars Daily, the Telegraph, and Popular Science. Amnon over at Spacepirations tipped me off to a Russia Today article from last year suggesting that the Soviet-era Buran space shuttle should be revived to fill the gap after NASA retires its shuttle fleet. I retweeted the link, and it caused a flurry of speculative tweets, mostly dismissing the idea. One of the Buran test pilots is quoted in the article, saying "The Energia-Buran programme was started to get the capability to attack the United States, just like the shuttle was able to attack the USSR. We also wanted to take the Skylab space station from orbit. Buran was supposed to put it in its cargo bay and deliver it back to Earth for studies." I've seen some discussion whether he meant to say "Mir" instead of "Skylab," but either way it seems a misguided perspective to suggest the shuttle was intended for military purposes. Thomas Gangale's blog Out of the Blue, Into the Black picked apart the article in great detail. Buran was the Soviet counterpart to NASA's Space Shuttle. It only flew once in 1988 before the program was canceled due to the fall of the Soviet Union. In 2002, a hangar in Kazakhstan housing the only Buran vehicle collapsed, destroying the orbiter and killing eight people. The Buran shuttle had some technical advantages over the Space Shuttle; for example, it could land automatically. Given that the program has been dead nearly 20 years, and the only working test spacecraft no longer exists, I think resurrecting the program is highly unlikely. Perhaps some aspects of the Buran technology heritage can be integrated into future space vehicle designs, though. After NASA's Space Shuttle is retired, the only way to for humans to reach the ISS in the near term will be on Russian vehicles. Having recently expanded its international cooperation with countries like China, India, and South Korea, Russia stands to benefit from the increased use of its launchers and will perhaps soon capture 50% of the commercial launch market. Thus, the Russians will likely become more important players in spaceflight during the next decade. I wonder if that influence will allow them to realize their plans to move Apophis, send primates to Mars, or revive their shuttle program.